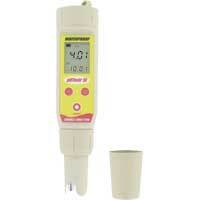 The portable tester indicates liquid pH level. The model available for testers has a resolution of up to 0.01 pH. Applications include spas, pools, hydroponics, labs, printing and chemical industries. Waterproof Pocket-Size pH Tester is designed to take repeatable readings in a variety of applications. A few applications include spas, pools, hydroponics, labs, printing and chemical industries.